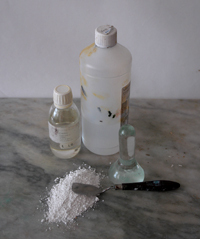 For the more advanced or classical oil painting techniques, making oil paint can be a valuable experience. It will enable you to fully use the specific features of each different pigment - an ready-made single pigmented oil paints (like Old Holland, or w&n) are pretty costly. The ingredients of oil paint are very simple: it's just oil and pigments. The only trouble is: getting these two very tough and sticky materials to mix properly. The easiest way to do that, is pure alcohol (96%). Add it when you start to work the oil and the pigment together, and then grind it for a while. The alchohol helps the oil go around every particle of pigment - which is necessary for getting good paint. Further down, there's tips on how to get oil paint in a tube (without enclosing air bubbles). Why make your own oilpaint? Of course, ready-made oil paint is very convenient. In the old days, a painter would spend half of his time (or more) on making oil paint. But unless you can afford a brand like "old holland paints", home-ground oil paints can add authentic value to your paintings. Not only if you like to work in the style of old masters, also when you favor pure materials to work with. Here you'll find a detailed guide on how to make oil paint, with a list of recommende pigments and oils, and tips for easy paint making. To see what all gets involved in making oil paint, read further. The most expensive ingredient for making oil paint is probably the denatured alcohol... but it's well worth it's money. You'll find it in your drugstore. Also check the pharmacy for empty paint tubes (If not available there: they're in the online art supplies store as well). All in all, making oil paint is not an expensive hobby. When ordering your art supplies , try to wait untill your ordering list adds up to over 200 dollars, then you'll get free shipping. Before you start making oil paint, it's a good idea to rub your hands with vaseline. Or use latex gloves. The oil needs lots of time to envelop every particle of the pigment - and a little help from the alcohol. Alcohol is a great ingredient and works the most difficult pigments into the oil, without effort - and disappears out of the paint completely while you work. Try to match equal amounts of oil and pigments, but its better to have not enough oil, than too much. At first, the mixture should be dry - wet it with alcohol. When the oil gets around the particles, the flow will come. The thickness of your paint matters a lot. It should be lean, so you can start lean and add medium later. But not too lean - it still has to make a good 'film'. Your paint has to get about as thick as toothpaste. If you dab and pull it up with a palette knife, the paint should stand up in a sharp tip. Only the thinnest part of tip may bend, but you should be able to make the paint stand up in a peak of about an inch high. Every pigment reacts differently in this process. Some pigments (like iron oxyde yellow) are extremely tough and dry when partly mixed, and suddenly start to flow like yoghurt when you grind them long enough. Without the alchohol, it's hardly impossible. To keep your project safe, let your paint rest overnight after grinding, to see if it stays okay (cover it well - put foil directly on the paint). During that time, the oil crawls slowly around the particles and the paint will finish itself. In the night, remaining alchohol disappears as well (alchohol makes your paint only seem thin). Still you might see the next day, that the paint got really thin - then you have to add pigments and grind again. Ever smoked and rolled your own cigarettes? That's just about how you get your paint into a tube. You knead your thick paint into a cylinder-shape, just a bit thinner than the tube you have for it. Roll a square piece of disposable palette paper around that cylinder (making a 'cigarette'). Shove the whole into the back of the tube, dab the tube on the table untill you see the paint reaching the mouth of the tube (put the cap on again). Then knead and push the paint from behind into the tube, while you pull out the palette paper bit by bit. Make sure it doesn't tear off, by folding the end of the paper before rolling it up. It's important you don't have bubbles of air hidden in your paint, because they'll make the oil come out of the paint - then you get a splash of oil with funny bits of paint coming out of your tube. Filling the tube may need some practice. Paint tubes like this keep good for at least a year. A step-by-step guide to making oil paint is in this oil painting ebook. 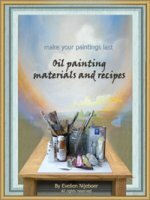 Here you'll find other recipes for gesso's, classical painting grounds and quick-drying underpainting materials as well. That's the least fun part of making oil paint - beforehand, make sure you have places to clean. Afterwards you won't be able to touch anything. Zest-it, water and soap are good, but if the color really doesn't come off your muller or marble plate: take some alcohol. Egg-tempera is a water-soluble, fast-drying paint, suited to make an underpainting for oil painting techniques. 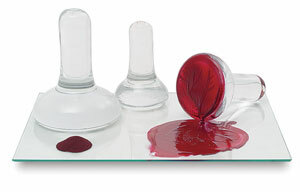 And with the right recipe, you can even work them into wet oil-paint! This is how the old Dutch masters got some speed into their workprocess. Here you'll find recipes for making egg-tempera paint. If you like more of this: I've put together an oil painting guide with recipes for making primers and underpainting materials as well, along with lots of other info on making boards, canvases, primers, varnishes and sizing. Oil paint is only a raw ingredient, part of a system that involves a painting ground, a sizing, a primer, underpainting materials, oil paint layers and eventually a varnish. All these elements together decide how your painting will look, and if it will stay good.